“Everyone is entitled to his own opinion, but not to his own facts.” I’m sure US Senator Daniel Moynihan had little clue, and would be disappointed to see, to what extent this now famous quote applies to today’s political climate. Although it was originally said in the 1980’s at the dawn of the postmodern era, nobody could have imagined just how unpredictable things would become. Now ever-invasive in the political economies of not just the US, but countries all over the world, postmodernism may be reaching unprecedented heights. In order for society to grapple with this new outlook on the world, it needs to understand what exactly entails the movement and what fueled its rise. The Stanford Encyclopedia of Philosophy defines postmodernism as “a set of critical, strategic and rhetorical practices employing concepts such as […] hyperreality to destabilize other concepts such as presence, identity, historical progress, epistemic certainty.” How does the American public tolerate “alternative facts” as the official justification of demonstrable falsehoods from the leader of the free world? For starters, there are many speculations that try to explain why we’ve arrived here. 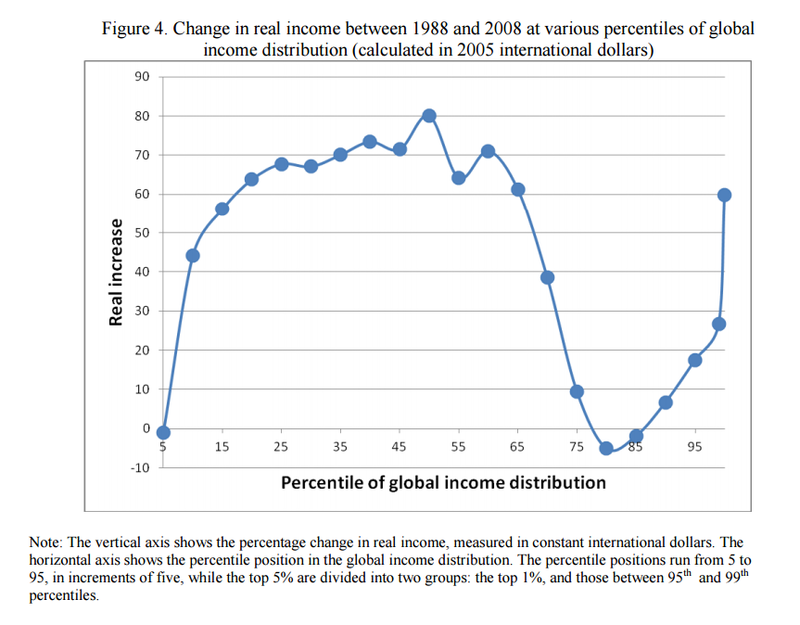 It’s most commonly referred to as the elephant graph, for the trend line looks like the outline of an elephant’s body. The elephant graph. || Branko Milanovic. It depicts the lack of growth in the middle classes of wealthy countries, even as poor countries’ middle classes and the top 1% are accumulating wealth like never before. As the majority of the American electorate, composed of middle-class, rural Americans, watches their jobs be outsourced and their bosses become extremely wealthy for it, anger and frustration blooms. It has ultimately manifested itself in the form of Donald Trump’s ascendance to the presidency. But the question that needs to be answered is how on earth this wave of populism was caught by a postmodernist like Donald Trump. It seems slightly ironic that a billionaire known for financing his business enterprises on junk bonds came to gain the trust and loyalty of the class hurt most by the fallout of junk-bond financing in 2008. Perhaps it wasn’t the image of Trump himself, but the rhetoric surrounding his campaign that attracted a population of desperate people. Rural America is on its deathbed. As jobs and businesses leave, so follows skilled labour and in comes a swell of opioids that leaves behind an uneducated, drug-addicted, and increasingly pessimistic society. A vulnerable people like this understandably clung to an anti-establishment figure who projects their anger and preaches the too-good-to-be-true phrase, “I alone can fix it.” There’s never an easy solution to problems such as these, but nevertheless, Trump has found one in immigrants and established politicians. A campaign that railed against public servants, blamed innocent populations for nationwide economic hardships, and vilified trustworthy news paved a pathway to which many disparaged people were attracted. The hope of an easy solution and someone paying the price for their hardships led rural America into the abyss of believing things they should surely have known not to be true. To put yourself in the shoes of one of those people may prove why leaders preaching falsehoods are so easy to follow. If I were a single parent and high school dropout who bounced from job to job in my small town, where all of my friends were in and out of drug rehab, then maybe I too would follow a leader who brought forth something new. It just seems too bad for the fate of the American public that that path led into a darkness too dark to see the truth. The above point is tightly connected to the point I write of here: polarization. America is as polarized as we’ve ever been. Geographically, we surround ourselves with likeminded people that don’t expose us to new ideals. We all chose news outlets that enforce our current political beliefs. To quote President Obama, “people watching Fox News are living on a different planet than those watching MSNBC or listening to NPR.” And increasingly, our politicians reflect our partisan divide in refusing to work with those on the other side. As political conversations often get heated, participants are less and less willing to admit they’re wrong. Instead, they graspat anything, even falsehoods they know to be false, to help enforce their views as superior. Polarization is dangerous, especially in the context of postmodernism, as it pushes both sides far enough away from one another that they cling to “alternative facts,” more so than to each other. In modern times, people have also come to feel largely disengaged from the workings of their own political institutions. The Atlantic article titled “America is Not a Democracy” brings together the desire of younger generations for a direct democracy, and the growing visibility of just how powerful the economic elites are in Washington. They reviewed the findings of the famous Gilens and Page study that tested the power of the elite on policymaking, writing, “[the elites] succeeded in getting their favored policies adopted about half of the time, and in stopping legislation to which they were opposed nearly all of the time.” And when reviewing the results describing the power of the average American, they write, “the preferences of the average American appear to have only a miniscule, near-zero, statistically non-significant impact upon public policy.” This frustration of not being able to influence your democracy, and knowing that no matter what you do you cannot change anything, is a feeling of weakness that can be easily manipulated. Just like polarization and middle class despair, from this feeling of democratic disengagement rose the populism swept away by postmodernism. If your government won’t respond to a thing you do, then why not send a walking middle-finger (Trump) their way? As that strong man becomes your apparent savior, then you don’t want to believe in the fact that he may be anything other than perfect. Like a woman swept off her feet by the perfect man, she may simply ignore the facts that he’s cheating on her. And even if she knows deep down that it’s true, she’ll continue to reiterate to herself and others the falsehood that it isn’t. There is no single answer as to why postmodernism sprung up in the American political arena. But the growing despair of middle class Americans, polarization, and the feeling of separation between a person and their democracy all accumulated to at least help prop it up. People are increasingly becoming more and more willing to believe what they want to, even when it isn’t true. But what else are they to do? The American electorate feels as though they’ve been backed into a corner with nothing to grab onto but “alternative facts.” So now that we know where society is at now, I suppose it’s time to ask ourselves how and where we go next.